This model SS-5-220 is our smallest soil sterilizer and ships factory direct (Brookfield, WI U.S.A.) via UPS Ground to most commercial, school, and residential addresses in USA and internationally.Call 602-621-0332 or email us (click here) for a shipping quote. Outside dimensions: Length 15.25", Width 14.25", Height w/cover 13.25"
An important first step in controlling weeds, pests (excellent for common fugus gnats), and pathogens safely, economically, and chemical-free in your screened soil or screened finished compost before using in propagating seeds and plants. The sterilizer is filled to the top of the container and then the unit is plugged in. The thermostat is then set to the correct pasteurizing temperature. The indicator light will glow until the batch is done and the sterilizer automatically shuts off. After the light goes off, wait 15 minutes then pick up the unit and the pasteurized soil will drop out the bottom. Next, beneficial amendments and supplements may be added for customized growing mixes. 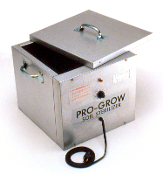 Important design notes: Pro-Grow sterilizer's proven design and specially selected materials allow for easy cleaning and drying to prevent molds and to promote longevity of equipment. Also, the special design is important because the dirt/growing media is NOT shoveled out of the sterilizer...when a metal shovel hits a metal unit, there would be denting and damage. Pro-Grow engineering has spent decades testing all of their equipment in their labs and is commited to manufacturing equipment with special designs features that are built-to-last. Estimated shipping wt. 28 LBS. Manufactured in the U.S.A.
**Note: For heat sterilization to be effective, the soil must have adequate moisture for proper heat transfer and adequate time and temperature for the application.